What to expect- Results in body transformation. Call today! Are you interested in adding life to your years and years to your life? Do you need some professional help developing your physical fitness and exercise program? Need some help with weight loss management, or sports conditioning for athletic skill development? Well you have definitely come to the right place, because Todd Dattoli, your New Jersey Personal Trainer for Far Hills, Bedminster, Bernardsville,Basking Ridge and surrounding Morris County and Somerset County NJ areas, is just an email or phone call away. I'M HERE TO HELP YOU. My name is Todd Dattoli and let me start off today by telling you that you will find no one who cares more about your health than I do, whether you are man, woman or child. Why? Because, I absolutely love what I do for a living! I feel that my intensity, passion and excitement for overall health and fitness will infect you to want to make being healthy a way of life and not just a temporary solution on the treadmill of life. I am especially passionate about children and their needs for specialized physical training programs so they can grow up healthy and happy. With the current childhood obesity epidemic in full swing, I have devoted my career to helping our children lead healthy, productive lives, which is why I love being a Sports Conditioning Coach, because children need caring, compassionate, knowledgeable and skilled professionals to help them be the best they can be. When you choose to train with me, you choose to succeed. You can expect to achieve a strong, fit and pain-free body, plus a new sense of inner peace and self-confidence. Being healthy is not something you do every once in a while. It is a lifestyle you lead everyday so you can lead a life that keeps you healthy and happy well into your golden years. Can't make it to the studio? Need to train at home? Whether you live in Bedminster, Far Hills, Peapack-Gladstone, Basking Ridge, Bernardsville, Martinsville, or the Bridgewater areas, you will get the best personal training service you can find. Training in your home can be just as rewarding as training in a gym setting. You just need the right trainer who knows how to get you the results you're after. Someone who is experienced at working in different types of settings with various types of equipment. I've even trained people with no equipment and they still got a workout that challenged them far beyond their expectations! With almost 20 years experience in the health and fitness industry, I am well versed in many types of training modalities and exercise programs. Rest assured, you will get results! 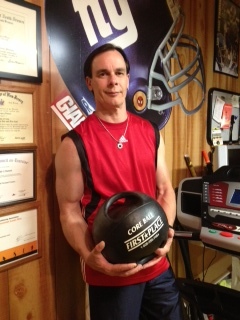 Need a personal trainer to come to your home in Morris County? No problem. Contact me if you live in any of these areas: Mendham, Chester, Long Valley, Mount Olive, Flanders, Budd Lake or Roxbury and surrounding areas. As your NJ Personal Trainer, in home or in studio, I am 100% confident that I can provide you with the knowledge, skills, guidance, support and motivation to completely enhance the quality of your life, whether you are an athlete or an athlete in the sport of life. Upon our initial meeting, no matter what setting you choose (home or studio), you will receive a Health and Fitness Evaluation during your first session, followed by monthly Progress Reports. These reports give you positive feedback and encouragement, and help keep you motivated to achieve your goals. Your Health and Fitness Evaluation will include a review of your medical history, body fat composition test (muscle mass vs fat mass), heart rate monitoring, blood pressure screening, cardiovascular fitness screening, muscular strength tests, flexibility and range of motion screening and a balance and posture test. Your weight and measurements will also be recorded. These tests, screenings and measurements all go into the makeup of how to design the proper exercise program that is tailored to your specific goals and needs. Much like building a house, an architect starts with a blueprint so they know how to build the house. 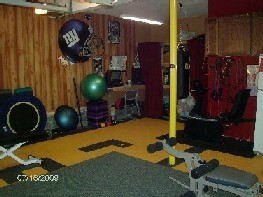 The Health and Fitness Evaluation is our blueprint for building your ultimate house: your body. Once your fitness starting point has been established, you and I will discuss your short and long-range goals. Then I will create your Personal Training Program. ARE YOU READY TO MAKE A LIFE STYLE CHANGE?! Let me help motivate you to "PEAK your health, and CONDITION your body!" Why Workout In A Private Studio Setting? If you've ever trained in a conventional health club or gym, you know how distracting your environment can be. Weights bang! Music blares! Spandex flashes in the background. Even in a home gym, interruptions can be unavoidable. I believe that every second of your workout must be carefully orchestrated and executed by a certified personal trainer, and that a private environment is essential for effective communication between you and your trainer. In a private studio setting, which I provide, you do not compete with anyone else for my attention, or for the use of state-of-the-art equipment. Instead, you'll find it surprisingly easy to focus on yourself and -- with my one-on-one help -- to take control of your body. Call or email me as I will be happy to discuss any questions you have pertaining to your health and fitness needs.